Posted on April 22, 2016	by "BUGGING" YOU FROM FRIDAY HARBOR! Something you don’t want to see in one of your hives! Small moths of Galleria spp., commonly known as Wax Moths can eat away the honey comb and leave behind damaging webbing, frass, and plain old ick! 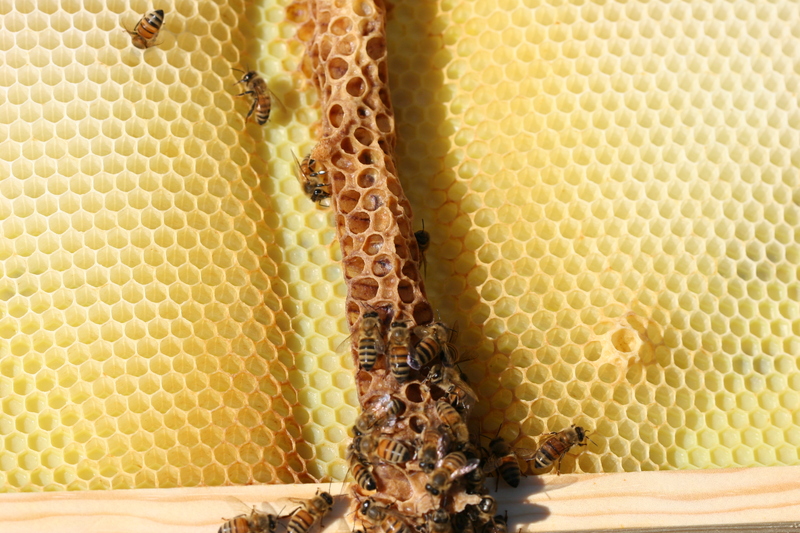 Preventative measures include proper storage of unoccupied hive hardware and frames, especially frames with pulled comb and even more so when there is leftover honey or pollen in that comb. 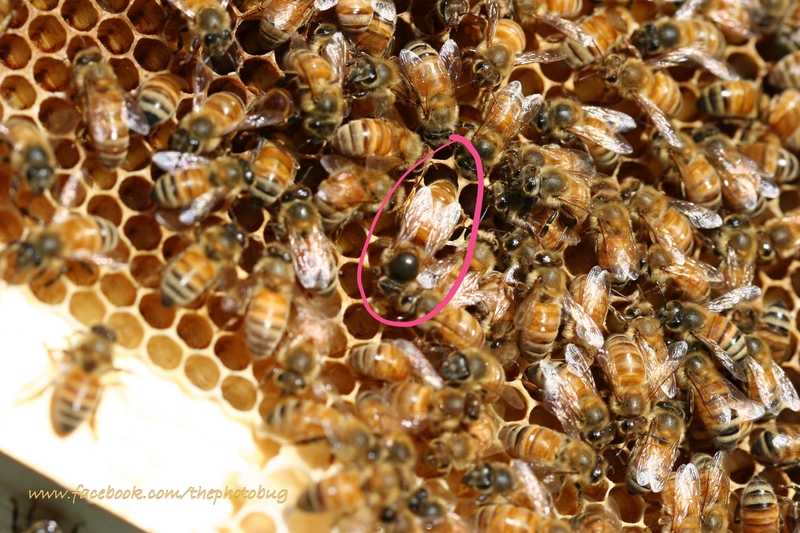 I am posting this so other beekeepers can use this as a tool to ID the problem if it happens in a hive. My problem here is USER ERROR! Plain, outright neglect! I stored a hive inside the house and used it as a place to set my coffee this winter. The bees from this hive had died and I didn’t want to put the hardware in our barn (because of the rats). Our deep freezer was broken so I couldn’t put the frames in there either. Storing it inside the house obviously wasn’t a good idea. But I LOVED the smell of the comb and it made the dark island winter much more bearable because of the honey-aromatherapy. So this spring when I noticed the first little moth flying around in the house…and then a few more…and a few more…and the other day, there were probably thirty of them just hanging out on the bathroom wall, I knew I had a problem. My handy cat (and feline companion, Millhouse) helped with the inside pest control problem. He’s been happy to swipe and stomp the pesky moth adults flying around. I took the hive hardware outside yesterday. This morning it all went into our newly-repaired, freon-filled deep freeze. (Thanks Lorin Geiser of Geiser Appliance Repair). This will kill all the moth larvae, pupae, and eggs. 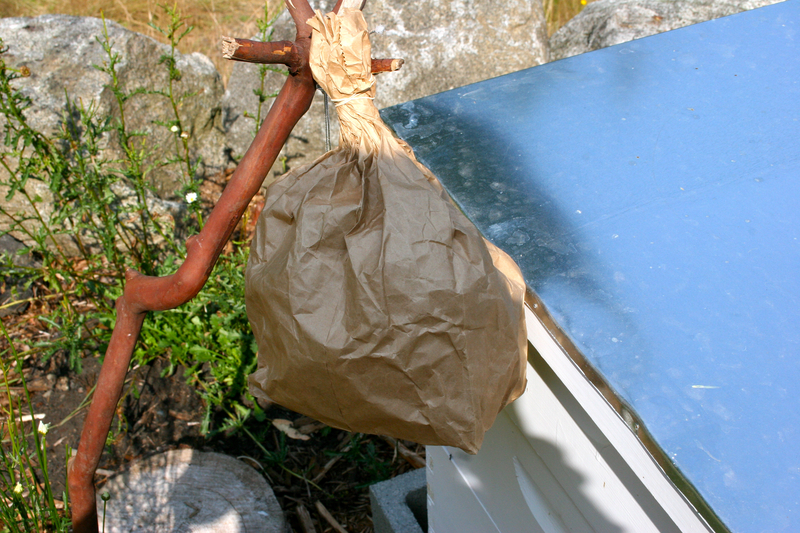 My take away advice here….If you have to store hive hardware and frames without bees inside, you need to read the paper I wrote about Wax Moths. It’s attached below the photos at the bottom of this blog! Don’t use your hive as a coffee-table either…not unless you use a new hive body that doesn’t have a gourmet buffet of honey comb inside for Galleria spp. Wax Moths. I’ve also attached a neat chart I found online illustrating the wax moth in the hive just below the photos here and my wax moth paper. Both are great resources for new-bees to beekeeping! Managed honey bee colonies act collectively as our “canary in the coal mine,” alerting us to the deleterious effects of toxic chemicals in the environment. The news is bad! Bees are dying! Scientific analysis of the effects of these toxic chemicals on wild (unmanaged) populations of other organisms is more difficult. How hard is it REALLY though (?) … to intelligently deduce that we are systematically killing more than just one of our important agricultural pollinators. Bees, worms, fish, birds, etc. An entire ecosystem is at risk! Read more here and know that we need to act fast to ban use of these chemicals before the damage is irreversible. Posted on August 8, 2013	by "BUGGING" YOU FROM FRIDAY HARBOR! There will be cash prizes and beekeeping products for the winners, and the best pictures will feature in the Vita 2014 Calendar. The entries will also be added to the hundreds of honeybee-related photos in the free, online Vita Gallery (www.vita-europe.com/gallery) which is proving highly popular with beekeeping speakers looking for photographs for their presentations and with beekeepers wanting to learn more about beekeeping experiences across the world. Entrants can submit up to four photos (up to 1mb each) relating to honeybees or beekeeping by emailing them to gallery@vita-europe.com. Photos can be on any relevant topic: from honeybee behavior, to beekeeping practices, foraging honeybees and honeybee produce. The competition is open to any individual. 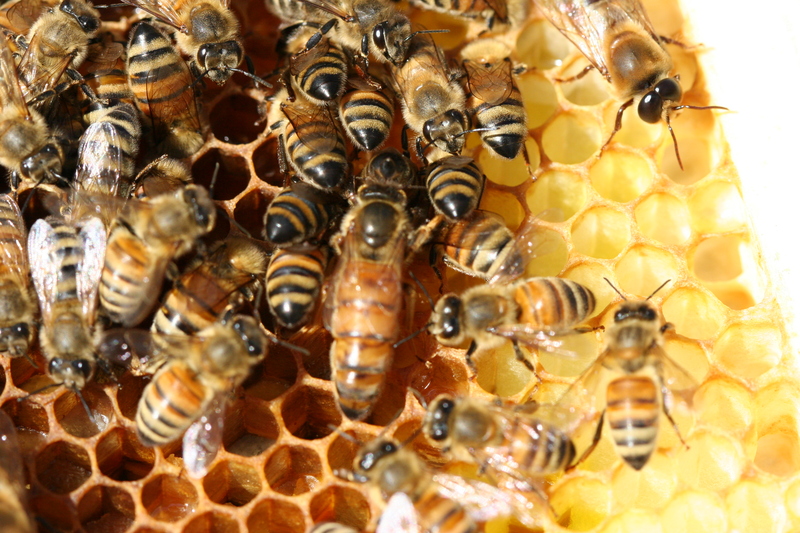 Up to four photos (up to 1mb each) relating to honeybees or beekeeping may be submitted. Please include your name, postcode (or equivalent) and country in your email. You may also include captions for your photographs if you wish. The deadline for entries to the competition is 20 October 2013. Entrants must certify that the image(s) they are submitting is their own work and that they own the copyright. It is the responsibility of each entrant to ensure that any images they submit have been taken with the permission of the subject and do not infringe the copyright of any third party or any laws. In providing images for the competition, each entrant agrees that Vita can put it in the online Vita Gallery for others to use and the Vita Calendar. Wherever used, Vita will credit the contributor. 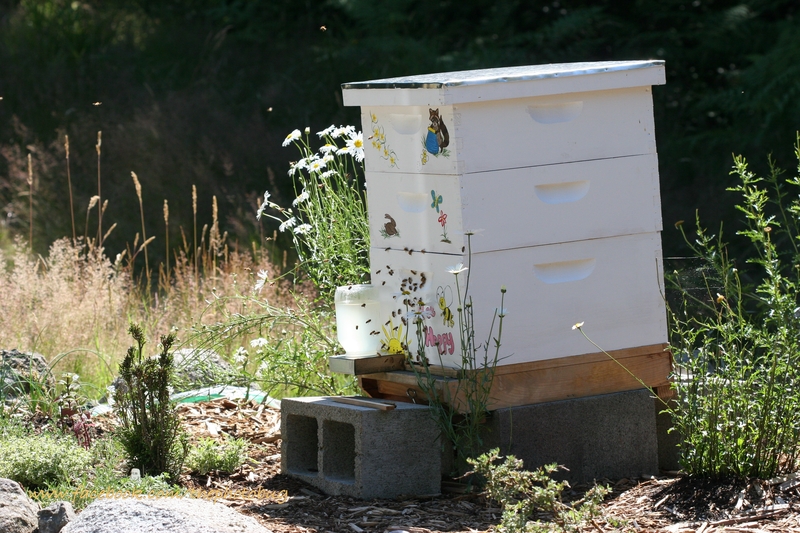 Honey bees are an integral part of the deeply-routed heritage of agriculture in the San Juan Islands. Farmers depend on these hard-working participants to bring residents and tourists alike a bountiful array of delicious and healthy fruits, vegetables, and honey every season. 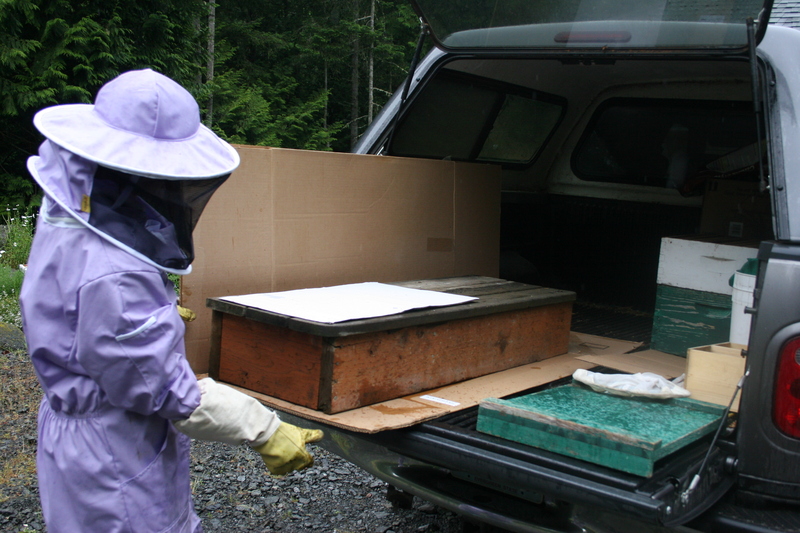 Beekeeping losses however, are mounting and perhaps San Juan Island residents are among the most active proponents of protecting the island ecosystems from the harmful pesticides that have been linked to bee colony collapses across the country. From conservation of farmlands to a ban of GMO’s in November 2012, islanders have shown initiative in creating a healthy and sustainable way of agriculture that translates into a healthier habitat for honey bees to weather the storm until the rest of the world follows suit. The phone call came in late June about bees under a doorstep. 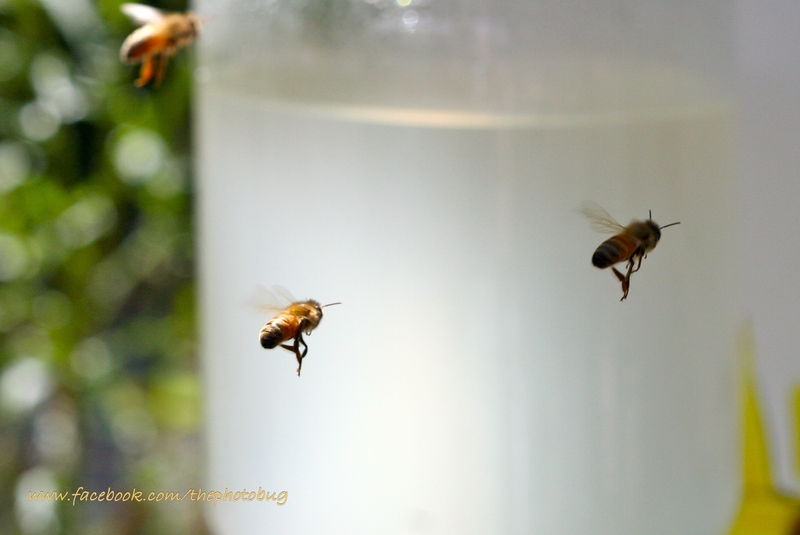 I was asked to come over and take a look to see if they were honey bees…if so, could I take them away! Unfortunately, the homeowner suffered from an allergy to bee stings and the bees hadn’t exactly set up housekeeping in the most desirable place. Honey bees don’t typically colonize an area so low to the ground, so I was anticipating the occupants under the step to be yellow jackets instead. Surprisingly a quick glance at the step yielded a flying specimen that was all too easy to identify. They were indeed honey bees! My next task would be to figure out how to remove them without causing harm to the small, but vital colony that had set up housekeeping too close to someone else’s house. It was raining and unusually cool that day, so I decided (with the generous permission of the homeowner) to take the whole step home with me. 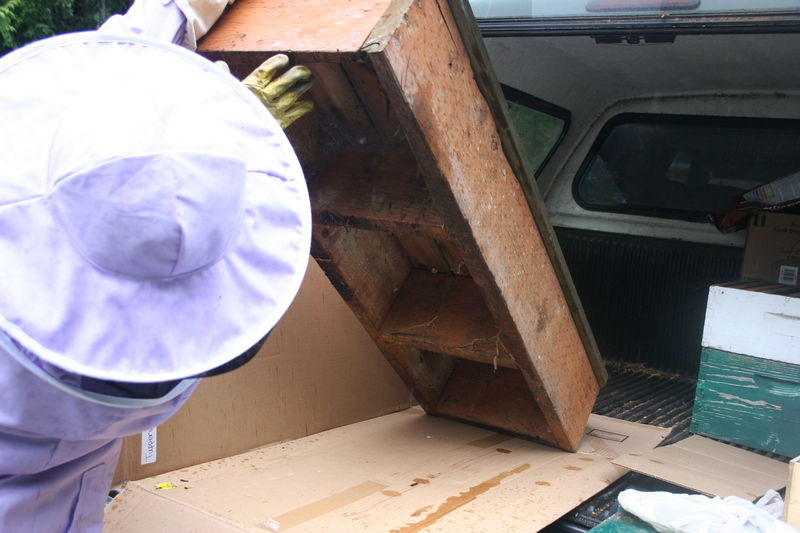 On a day like this, the colony was huddled together to keep warm, so I was able to haul them off in my truck camper losing few, if any, of the bees. 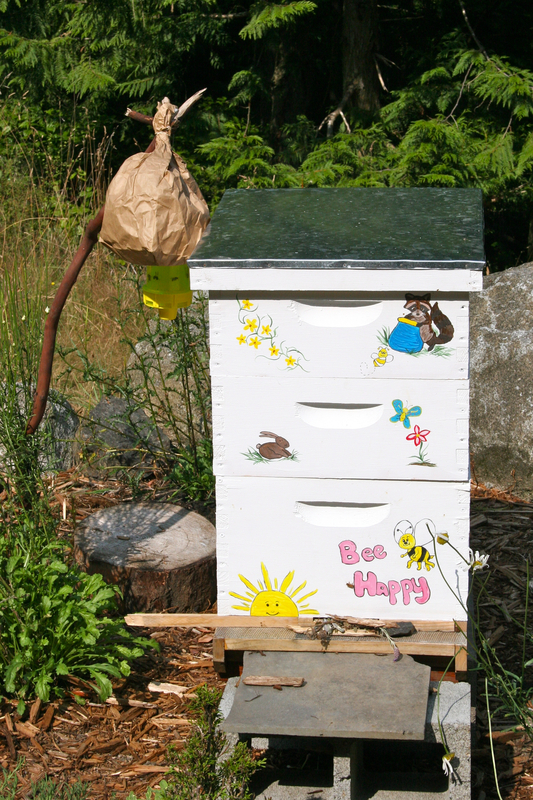 Once home, I set the step with the bees in a little garden area and placed an empty hive box (super) on top of the step with a jar of sugar syrup to feed them. This would give me time to devise a plan to cut them out of the step and relocate them safely into a hive box. A beekeeping friend loaned me some empty frames and I found that drawer of rubber bands I’d been saving and waited for a sunny day to get to work. On July 9, 2013, I decided the bees had oriented themselves to their new location and now it was time to put them into a new home. With the sun overhead, I had all my tools at hand and a helpful partner. 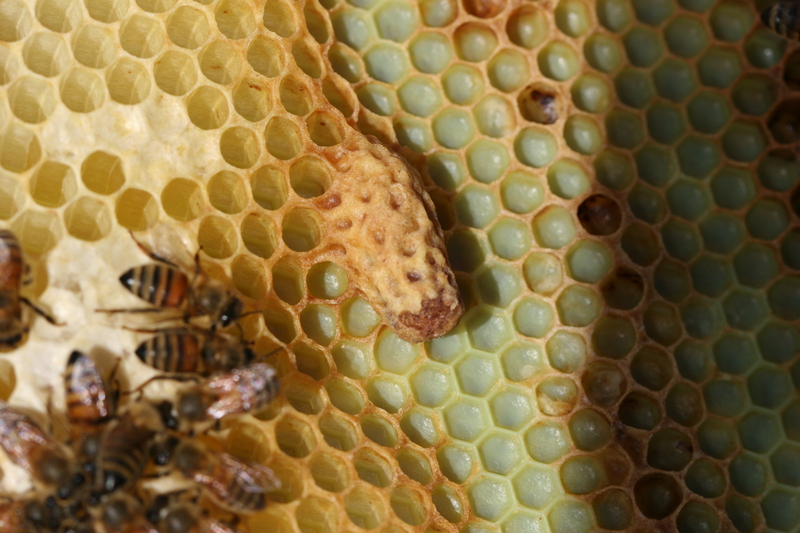 Wearing our bee suits, we carefully turned the step on its side to inspect the honeycomb built by this little colony. There were about eight oval-shaped combs ranging in diameter from 5 to about 12 inches. The bees blanketed these sheets of comb attached to the top of the step. One at a time, and with extreme care, I used a sharp knife to loosen the comb from the step. 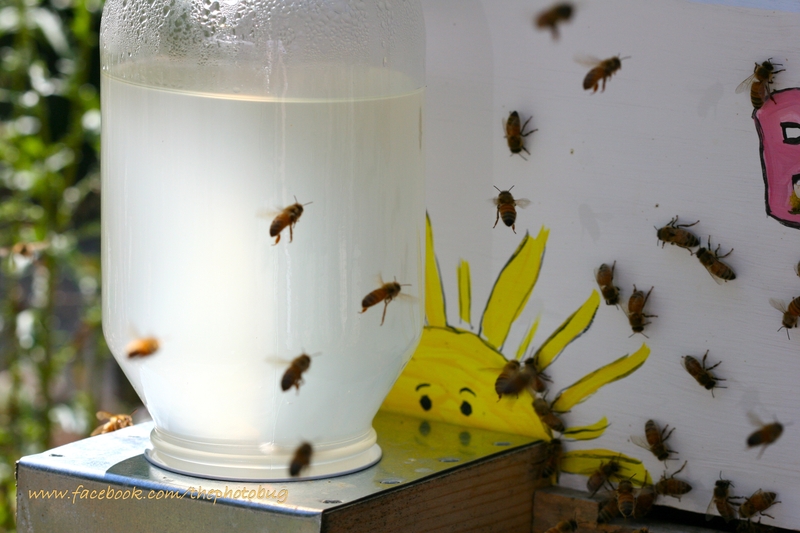 The wax is really pliable when it gets warm, so gentle handling is a necessity or you will squeeze it, damaging the bee brood (baby bees) and spilling out honey. After cutting out each sheet of comb, I had my partner help me insert it into an empty frame and secure it with a rubber band. 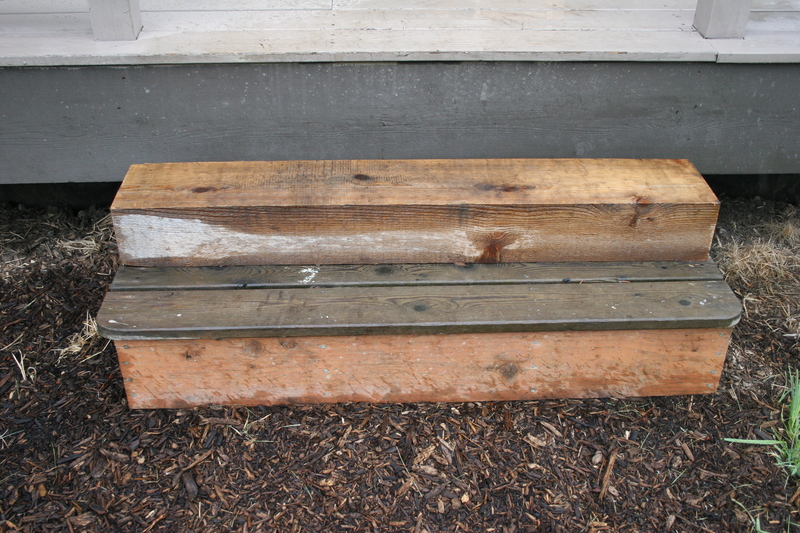 We were careful to make sure to place the comb in the same orientation it had been in when attached to the step. The bees have the cells of the comb angled just a certain way so as to keep the contents from being affected by gravity and spilling out. 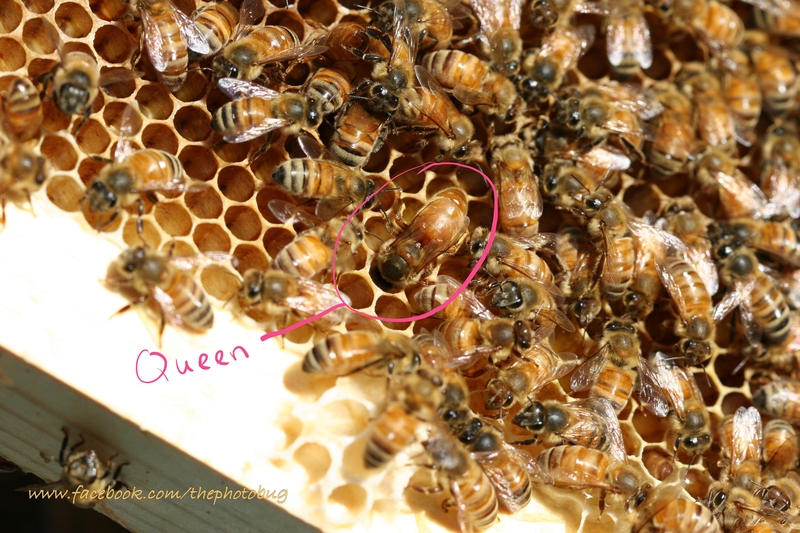 Once we’d finished about three sheets of comb, I spotted the queen. She was a very healthy specimen and I wanted to make sure she didn’t fly away in all of the disturbance. Using a bee brush to gently pick her up, I moved her onto one of the newly rubber-banded frames already placed into the new hive box. Worker bees soon surrounded her, responding to her familiar pheromones and undoubtedly exploring their new surroundings. Finishing the last few sheets of comb, I started to get really warm under all the protective bee gear. I had been observing how gentle this colony of bees seemed to be, so I decided to do the rest of the work sans my veil and gloves. Working with much more dexterity, I wasn’t stung once. Amazingly, we were able to remove and secure each of the sheets of comb into the frames. I’m happy to say that we moved this colony with success! The bees are thriving in their new home! 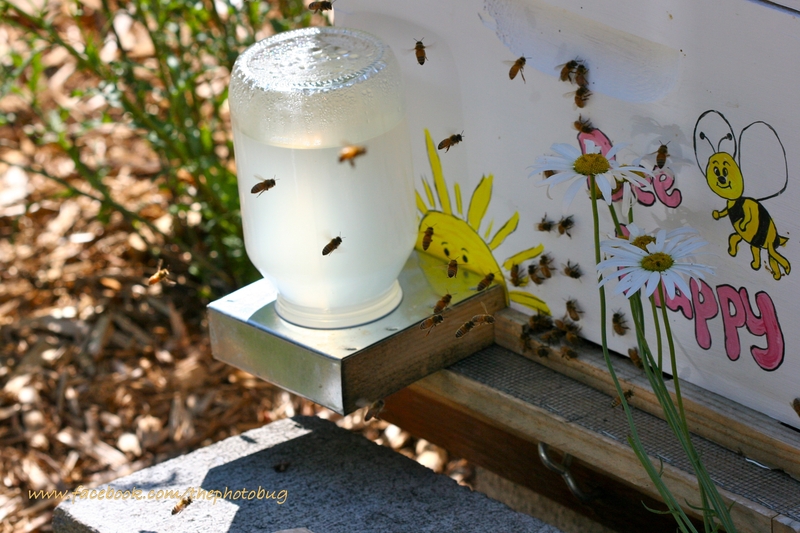 How you can help honey bees too! 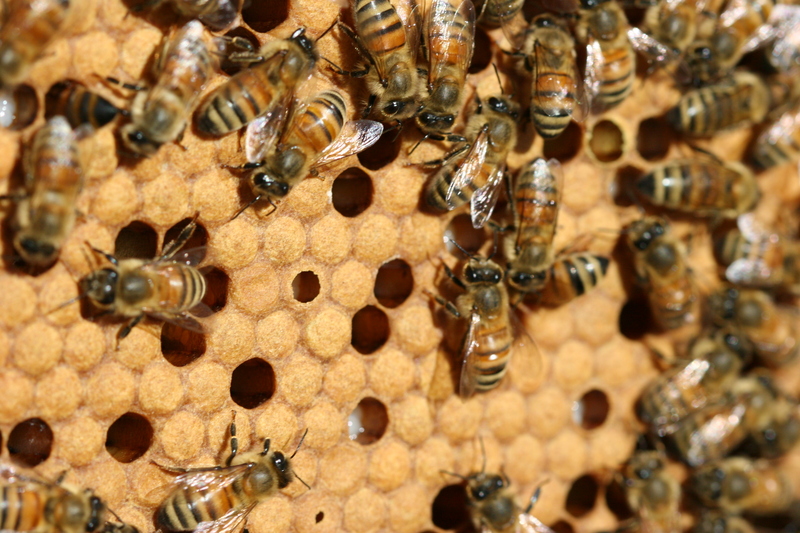 There’s lots of buzzing about honey bees going on in the world. Honey bees pollinate 1/3 of the food we eat! Current research is showing an undeniable decline in populations of these well-known agricultural pollinators. No longer can we ignore that the seemingly innocuous use of chemicals and pesticides found stocking the shelves in our markets are poisoning some of the smallest, but most critical links in our food chain. You can help by eliminating or at least minimizing use of chemicals in and around your lawn and garden. Choose landscaping plants that are bee-friendly. Write your senators and express concern about the toxic products on the market. Support local organic farmers and bee-aware of your eco-footprint on the earth! Posted on August 24, 2012	by "BUGGING" YOU FROM FRIDAY HARBOR! Last week I went out to do a consult for someone needing a little help with their beehive. They needed help finding the queen and wanted a general assessment as to the health of their colony. This is fairly easy to fix as you can just trim the comb off and adjust the frame spacing so they can start over. Maybe the bees won’t be too happy about this, but it will make it easier for you to see what’s going on if the comb is drawn out evenly across the foundation. Next, I found a queen cell. It hadn’t been opened and was near the top of a frame in the super above the deep bottom super. 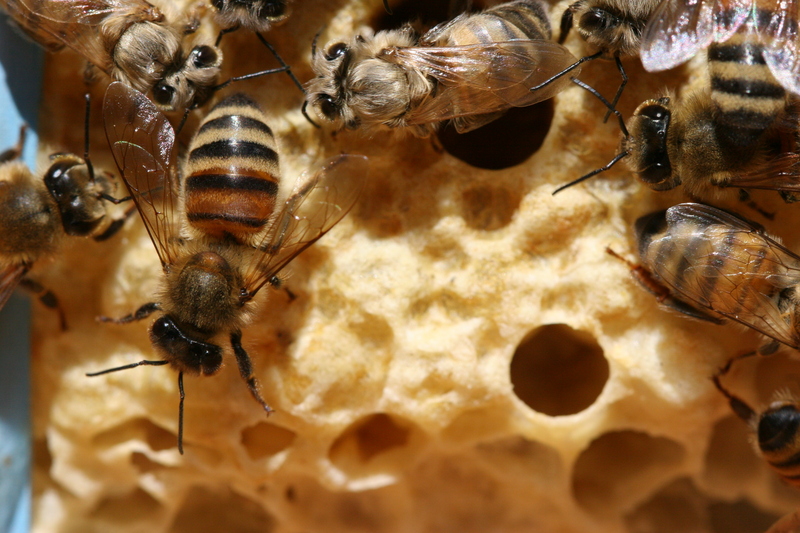 My client reported that earlier in summer, while on vacation, her bees swarmed. She was concerned about crowding again and wanted to know what to do. Her colony didn’t look crowded though and the frames in the upper boxes still had plenty of room, so this cell could be an indicator that her existing queen is failing, or it just might be left over from the supersedure earlier in summer. 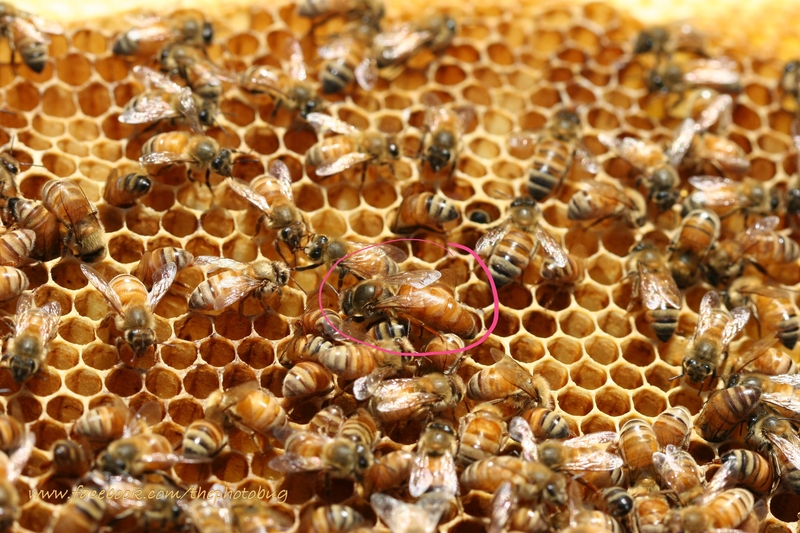 After examining the rest of the frames, I think the queen cell could just be scraped off. The brood pattern looked good. 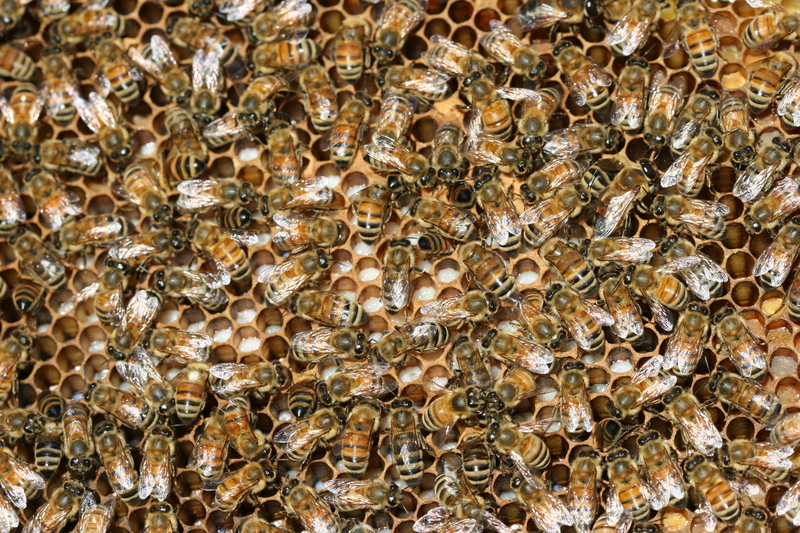 There were healthy-looking uncapped larvae and capped brood, indicating the queen was laying well. Overall, the colony health appeared great. 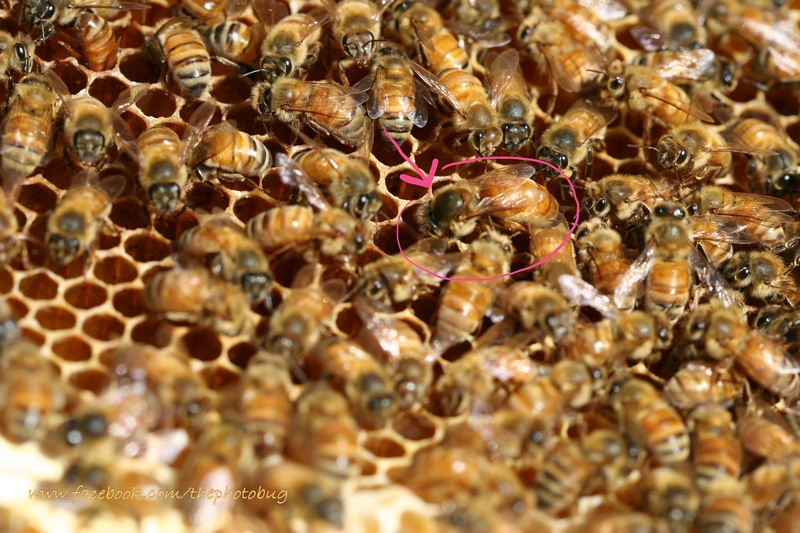 I didn’t find any indication of varroa mites, but if you see them at any time, my recommedation is Hopguard strips. As far as the hive population, I’d have to say that in spite of a reported swarm earlier in the season, this colony was thriving. I found the queen on about the 3rd frame pulled out of the deep super on bottom and she looked good. This was a colony of Italian bees and in my experience, they are so gentle and easy to work with that inspecting them that morning was a piece of cake. Recommendations? 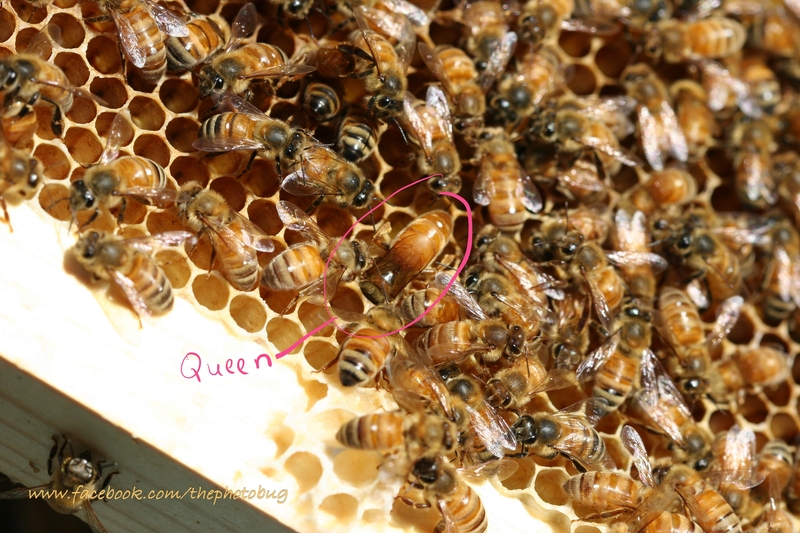 Trim the irregular comb, keep an eye on the queen cell or cut it off, and continue to assess the laying pattern of the existing queen. 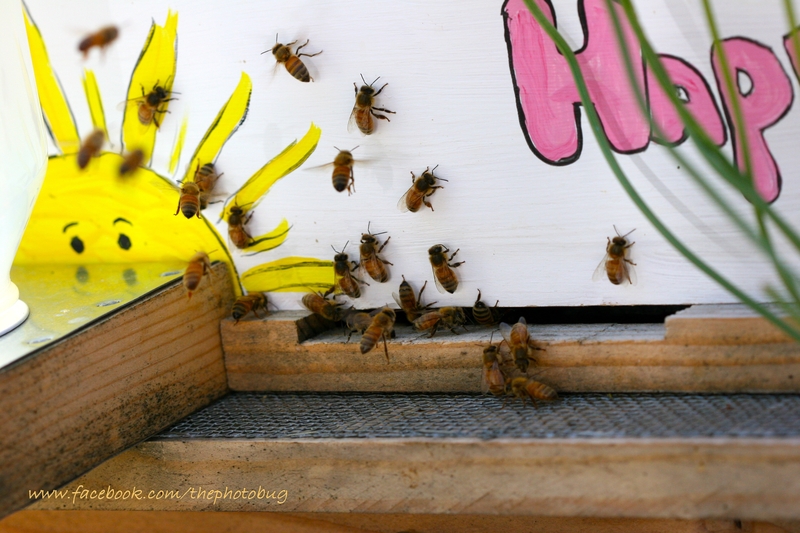 I might put a fondant across the frames on the bottom super (just above the bees) as they begin to ball up as temperatures dip later in the fall, but I expect these gals will overwinter just fine. 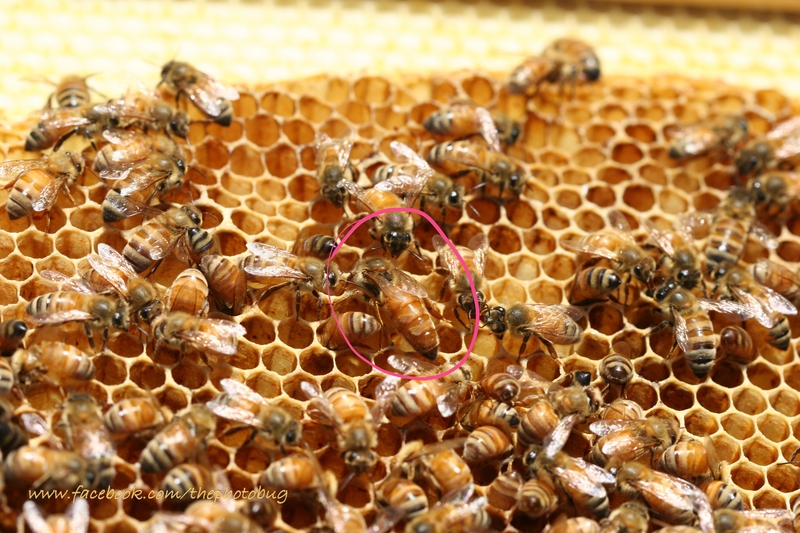 Two days ago on July 24, 2012, I noticed an unusual amount of activity right outside of my hive. Maybe for someone else’s hive this would be perfectly normal, but for my struggling colony, seeing so many of my bees flying right at the entrance was something different. What was encouraging for me in observation of this behavior was that I’d seen it before…on the day I photographed my new virgin queen taking off on her mating flight. Could it possibly mean that she had returned? 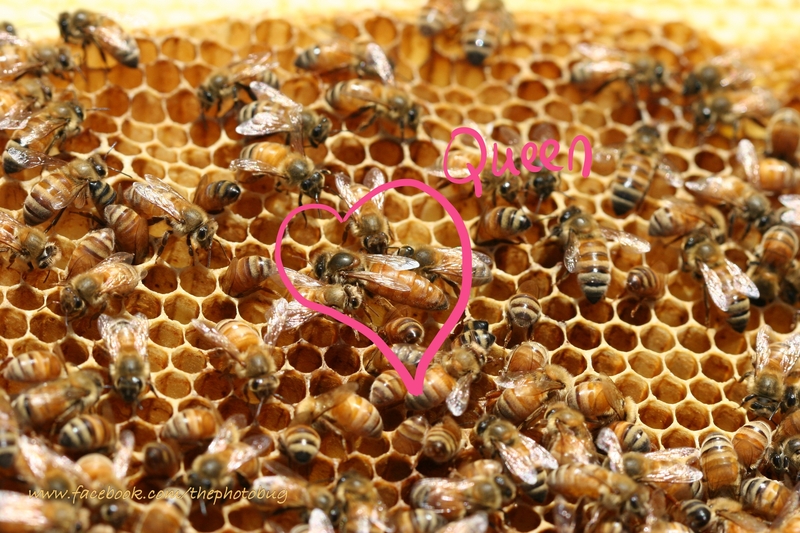 If you’re following along with my posts, you’ll know I looked in the hive this day and tried to find some evidence of the queen’s presence. I found that my workers were building lots of comb. 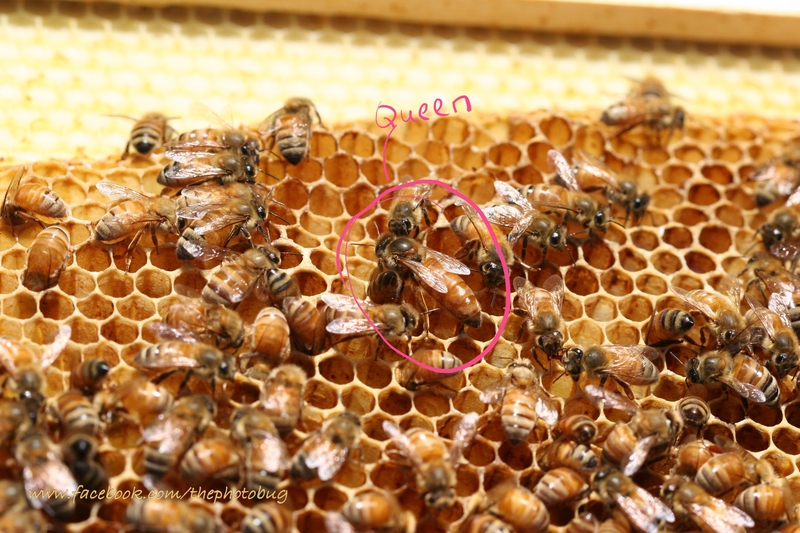 So much comb that the queen could certainly hide underneath where it was built out away from the frame (yes I need to work on my frame-spacing and get it jiving with “bee-space” so this doesn’t happen). I didn’t see eggs, but I saw cells filled with a clear-ish jelly-like substance. 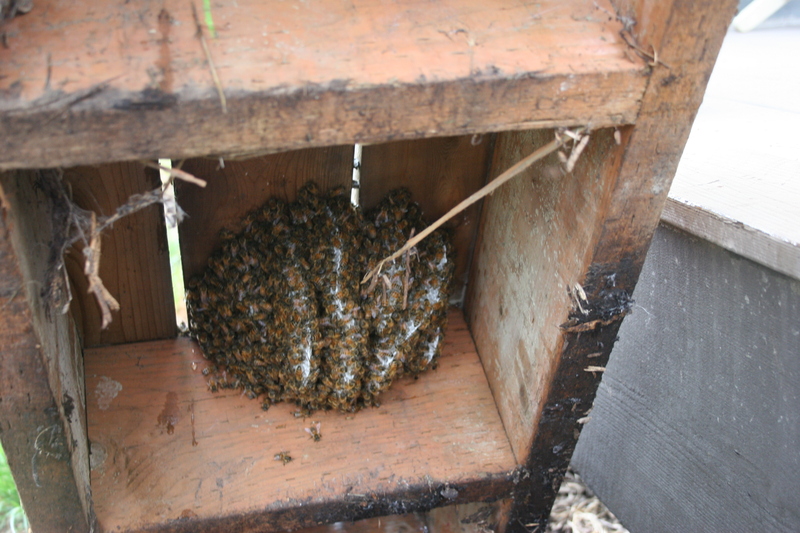 Somewhat disappointed, I closed the hive up that day and yesterday, I returned to take another look. The sun was out and it was warm, but one thing was different. There weren’t as many bees flying around the entrance, as there had been the day before. Hmmn…could something have changed in the course of a day? With my box of supplies handy (I had my veil, camera, magnifying glass, hive tool, and gloves), I opened up the hive for another look. Carefully, I disengaged a frame, trying hard not to damage the wax the bees had built that now connected it to the adjoining frame. Holding it up to the light, I got out my magnifying glass and slowly looked into the uncapped cells I found to see if there were eggs. I didn’t see any, so I took off my veil to try and get a better look. My hair wasn’t pulled back and kept falling right onto the poor little bees that were trying to stay on task. I worried at first they might become defensive, but you know, they just kept right on doing what they were doing. After checking that frame thoroughly, I walked back over and returned it to the hive and chose the one next to it. This was going to be my lucky frame. Guess what I saw? Yes, there she was! Ecstatic, I grabbed my camera with one hand and kept one eye the whole time on my queen, crawling across the frame and backing her abdomen into cells one at a time. Even better! She’s laying eggs. Snapping away, I took enough photos to post so you can see too. 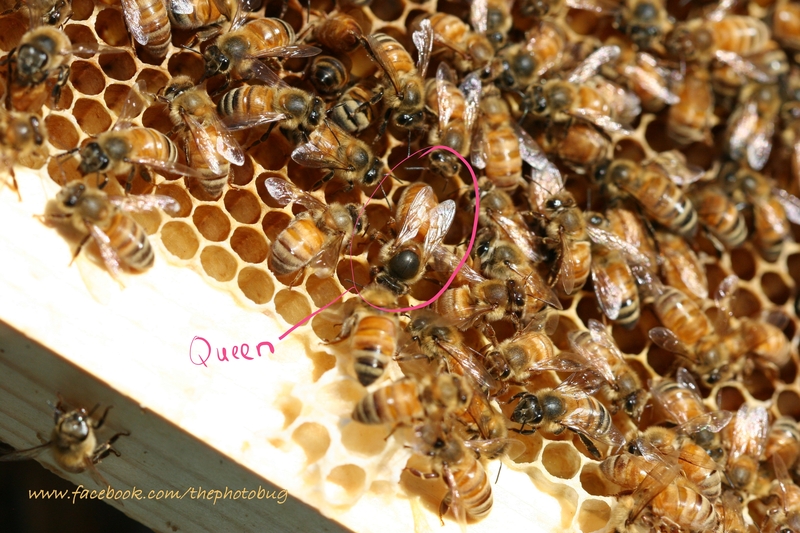 After all the excitement, I VERY carefully returned the frame she was on to the hive. I was so careful! Gently lowering it all the way in so as not to accidentally squish her or knock her to the bottom, I returned her to her castle. She was beautiful! Perhaps now there is hope for these little gals to recover their population enough to see me through the winter here on the island. I am in awe of their tenacity for survival in spite of the hardships they’ve faced. 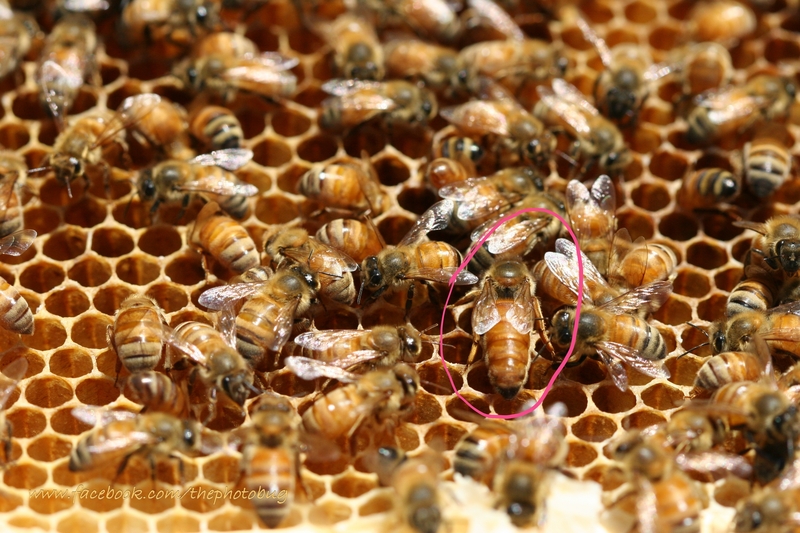 They’ve endured the loss of three queens (I’m counting that one that flew away before I even put her in the hive), varroa mites, deformed wing virus, too many drones, and dreadfully cool summer weather. I’m rooting for them though…and hope you will too! Leaving the queen to do her thing for the next week or so. “Bee” back soon with an update! surrounded by her loyal subjects!